A bullseye that is more than worth your time. This carefully crafted book nails the astonishing personal story and clearly explains layers of U.S. history and movements. For ages 12 to 112. 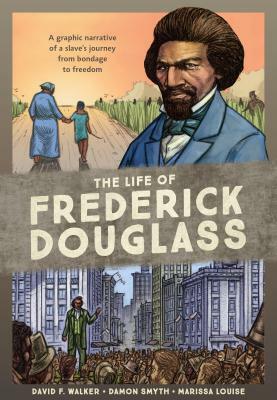 A graphic novel biography of the escaped slave, abolitionist, public speaker, and most photographed man of the nineteenth century, based on his autobiographical writings and speeches, spotlighting the key events and people that shaped the life of this great American. Recently returned to the cultural spotlight, Frederick Douglass's impact on American history is felt even in today's current events. Comic book writer and filmmaker David F. Walker joins with the art team of Damon Smyth and Marissa Louise to bring the long, exciting, and influential life of Douglass to life in comic book form. Taking you from Douglass's life as a young slave through his forbidden education to his escape and growing prominence as a speaker, abolitionist, and influential cultural figure during the Civil War and beyond, The Life of Frederick Douglass presents a complete illustrated portrait of the man who stood up and spoke out for freedom and equality. Along the way, special features provide additional background on the history of slavery in the United States, the development of photography (which would play a key role in the spread of Douglass's image and influence), and the Civil War. Told from Douglass's point of view and based on his own writings, The Life of Frederick Douglass provides an up-close-and-personal look at a history-making American who was larger than life. DAVID F. WALKER is an award-winning comic book writer, filmmaker, journalist, and educator. Walker is best known for his work in comics, including Shaft: A Complicated Man (Dynamite Entertainment), winner of the 2015 Glyph Award for Story of the Year, and its sequel, Shaft: Imitation of Life. His work for Marvel Comics includes Luke Cage, Occupy Avengers, Power Man and Iron Fist, Nighthawk, Fury, and Deadpool. He's also worked for DC Comics (Cyborg), Boom! (Planet of the Apes), and IDW/Monkeybrain (The Army of Dr. Moreau). He is the creator of the prose YA series The Adventures of Darius Logan, and author of the novel Shaft's Revenge, the first new novel starring the iconic black detective in more than forty years. DAMON SMYTH is an illustrator and comic book artist. MARISSA LOUISE is an illustrator and colorist whose color work has appeared in comics and graphic novels from Dark Horse, Image Comics, and BOOM! Studios, among others.